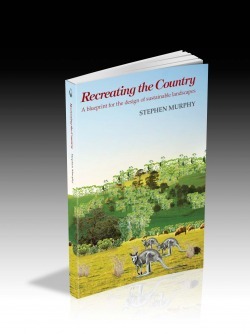 Published by em PRESS for Ballarat Region Treegrowers, Recreating the Country challenges landholders and land managers to consider new ways of thinking about how we might reverse the inexorable decline and disappearance of Australian plants and animals from rural landscapes. While integrating conservation and production has become the catchcry from foresters to dairy farmers, what can be practically done? This book provides the ‘stretch goals’ and the blueprint for ways of adding habitat and designing more ‘wildlife-friendly’ properties. It’s set to become the ‘bible’ for a new form of revegetation – the ‘biorich plantation.’ Integrated with other forms of vegetation, these would aim to enrich habitat potential across rural landscapes, not just for a lifetime, but in perpetuity. He has now made a more ambitious 33 minute film on large scale, community driven landscape restoration in south-east Australia and Sri Lanka – visit the rediscovering the country website for a free download. The biorich plantation fits within the concept of analogue forestry, which as a first principle mimics the structure of the original natural forest in its design, while incorporating productive elements for use or sale by the landholder. Author and ecologist Stephen Murphy has, with his wife Lina, run a successful native plants nursery in central Victoria for over 25 years. At the heart of Recreating the Country are ten design principles, observed from nature, which set out to bridge the gap between farm forestry and environmental plantings and bring back the bush in rural landscapes.